Urban Adventures tour guide Jason Kucherawy gives participants a crash course in pork farming and processing. 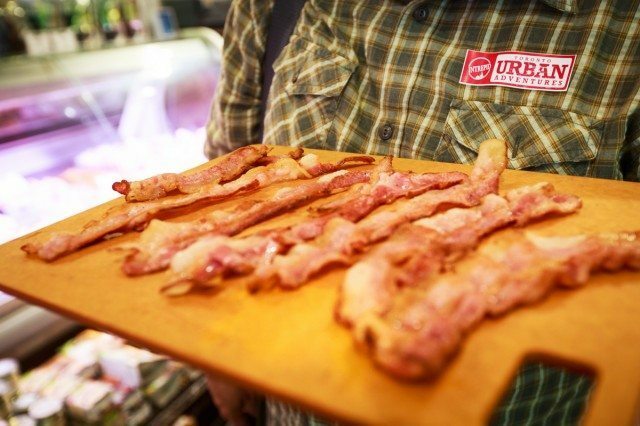 To say that “When Pigs Fry“—the latest and tastiest addition to Toronto Urban Adventures‘ tour offerings—is simply a bacon tour would sell it short. There’s definitely bacon (sweet and savoury, fried to crispy perfection), but there’s also so much more. As guide Jason Kucherawy eloquently said as Sunday’s tour began (the tour is offered weekly), the goal was to “get under the skin of the city” and learn something about Toronto’s rich history and current culinary scene. Perhaps surprisingly, the tour also included a strong anti-cruelty message, with a focus on local and sustainable farming methods, and organic and cruelty-free products. 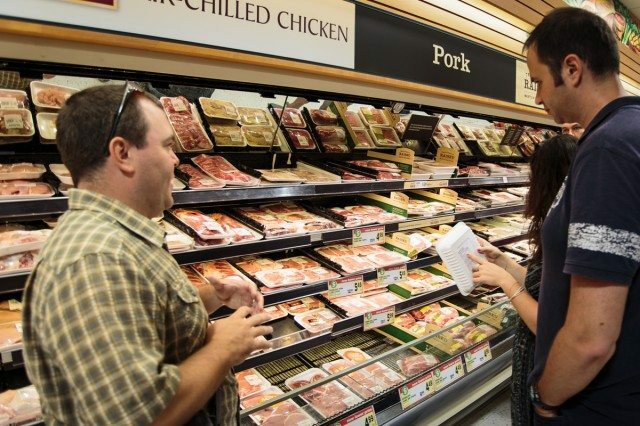 To that effect, the tour began at a local Metro supermarket, where Kucherawy invited tour participants to look at the way pork was packaged and produced, and in particular to note how cheap pork products tended to be in relation to other meats. Jason then explained the factory farming tactics that allowed pork to remain so cheap, such as keeping the animals in cramped conditions, dosing them with antibiotics to keep the diseases that easily spread in such close quarters at bay, and using growth hormones to decrease the amount of time pigs take to grow to adulthood. The tour’s culinary component began at Paddington’s Pump, right across from St. Lawrence Market. While tour participants enjoyed one of the pub’s peameal bacon sandwiches with mustard, Kucherawy explained the origins of “Hogtown” as a nickname for Toronto, and the part that the William Davies pork processing and packaging company played in making Toronto an economic power in the latter part of the 1800s. 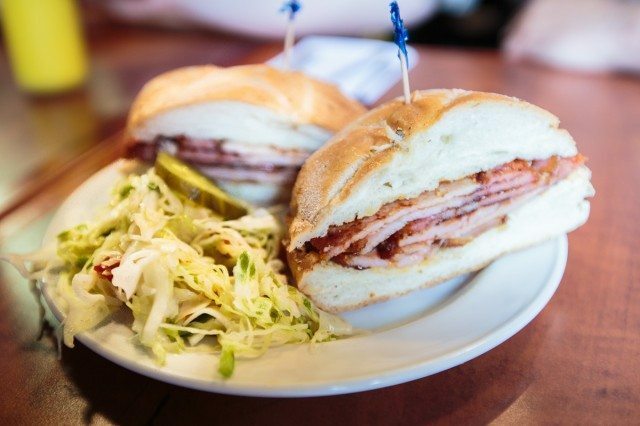 The peameal bacon sandwich from Paddington’s Pump. The next leg of the trip required a streetcar ride to King Street West, during which Kucherawy amused tour participants with pork-themed trivia (with maple-bacon saltwater taffy as prizes, of course). 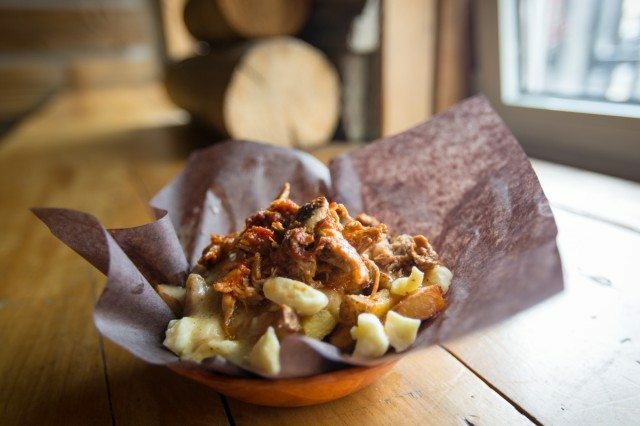 The next delectable pig product on the menu was the pulled pork poutine at Lou Dawg’s Southern Barbecue. Lightly sweet barbecue sauce complemented the richness of the gravy and the sweet, perfectly squeaky Quebec cheese curds. Kucherawy explained the origins of barbecue as a cooking process, and also why pork takes so well to the method: the meat breaks down, he said, and absorbs the smoky flavours while becoming tender. The pulled pork poutine at Lou Dawg’s Southern Barbecue. The penultimate stop on the tour (after a pleasant stroll through Toronto’s graffiti alley to work off some of the calories) was The Healthy Butcher on Queen Street West. Dealing only with ethically sourced meat, the vast majority of it local, the products at the store stood in stark contrast to the stuff at the supermarket, though it was much more expensive. The visual difference in the meat was striking: where the supermarket meat had been grey and insipid, what was on display at The Healthy Butcher had a vivid, vital pinkness to it. And the flavour? There was no comparison. We sampled lightly fried pieces of bacon, the fat sweet and melting, rich and complex. Bacon from The Healthy Butcher. Sometimes the tastiest foods are the simplest. The final stop was WVRST, a specialty sausage restaurant laid out like a traditional German beer hall. Here the tour participants sampled currywurst, a popular German street food made of sliced Kranjska sausage covered in ketchup and dusted in curry powder. The slightly garlicky sausage brought out the sweetness of the ketchup and the floral pepperiness of the curry. It was an excellent note to end on, emphasizing the sheer versatility of pork as a protein. 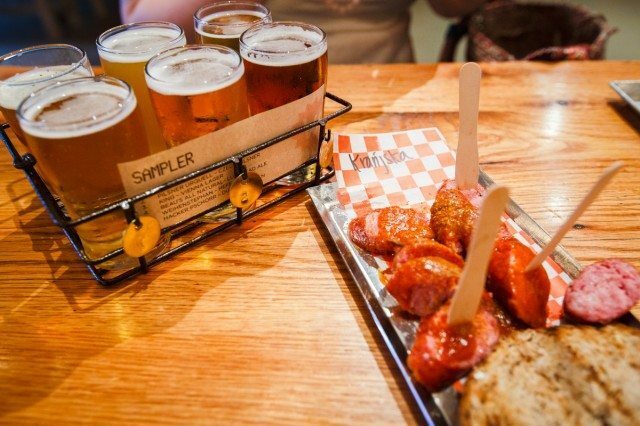 Currywurst and a beer sampler from WVRST. Photo by Daniel Cooper. At the end of the “When Pigs Fry” tour, participants’ bellies were full. More than that, the tour offered a unique glimpse into Toronto’s history, from the city’s agricultural roots to its contemporary culinary renaissance. The “When Pigs Fry” tour runs every Sunday at 2:00 p.m., is approximately 3 hours in duration, and is $55.76 per person.